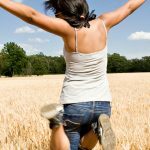 Be smart, be Energy Smart. The smarter way to save energy. 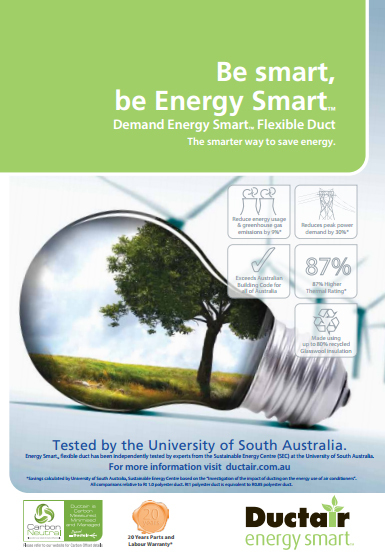 Independently tested, experts from Sustainable Energy Centre (SEC) at the university of South Australia have proven Energy Smart flexible duct can reduce peak power demand by a massive 30% and make your system 9% more efficient. Improves system efficiency, reducing energy consumption, CO2 emissions and running costs by 9%. Coupled with an inverter unit, Energy Smart™ can help save an incredible 19% more energy than a fixed speed unit with Rt 1.0 polyester duct. Using Energy Smart™ ducting you may be able to reduce the size of your A/C unit and receive the same coverage. Better insulation properties with 87% higher thermal rating than S.A building code standard Rt1.0 polyester duct.